Headquartered in the Netherlands, the stores are franchises of Inter IKEA Systems BV, the company tasked with increasing the availability of IKEA products through worldwide franchising of the IKEA concept. Given the company’s rate of expansion and globalization, it has had to invest heavily in IT over the years. Different languages, operating environments, processes and technology in each location made it difficult for IKEA to operate as efficiently as it wanted to. Despite the strong store synergy driven by the concept, different countries and retailers were collecting different levels of financial information, so there was no continuity. IKEA concluded that it needed to streamline the accounting working routines over all locations and to operate in the same way across all countries, stores and finance departments. 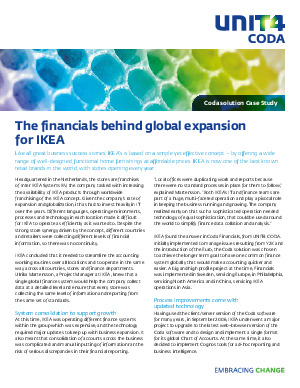 Ulrika Martensson, a Project Manager at IKEA, knew that a single global finance system would help the company collect data at a detailed level and ensure that every store was collecting the same level of information and reporting from the same set of standards.